These Coconut Oat Bran Muffins are hearty and sweet with flavor inspiration from Cracklin’ Oat Bran cereal. These first few weeks of school are always a little rough – early wake-ups, cooking breakfast, packing up lunch, and then rushing out the door to meet the neighborhood bus pick-up. 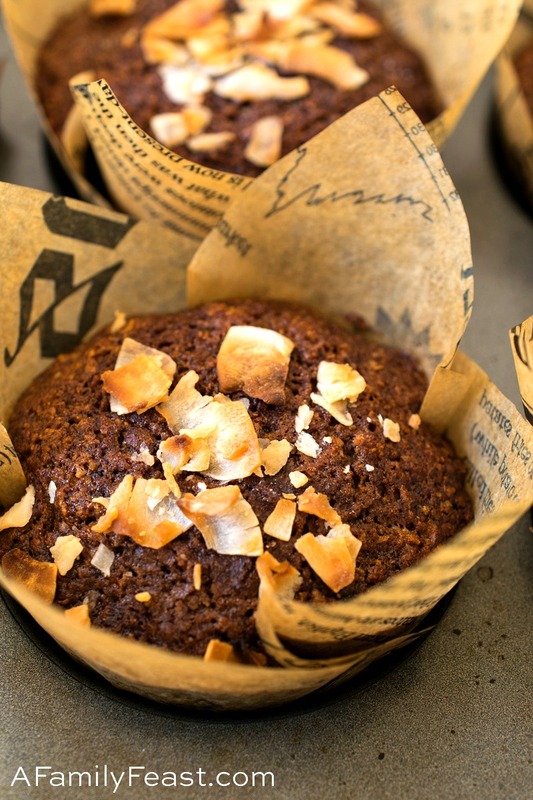 So, we’ve baked up a batch of these Coconut Oat Bran Muffins for a delicious grab-and-go breakfast. These moist and delicious Coconut Oat Bran Muffins were inspired by a box of Cracklin’ Oat Bran cereal that I bought over the summer. While shopping in the cereal aisle, I spotted that addictively good, crunchy, cookie-like cereal and – on a whim – bought a box. Forget about eating it for breakfast, Jack and I snacked our way through the entire box of cereal – at which point I commented that it would be great to recreate the flavors as a Coconut Oat Bran Muffins. Challenge accepted for Jack! 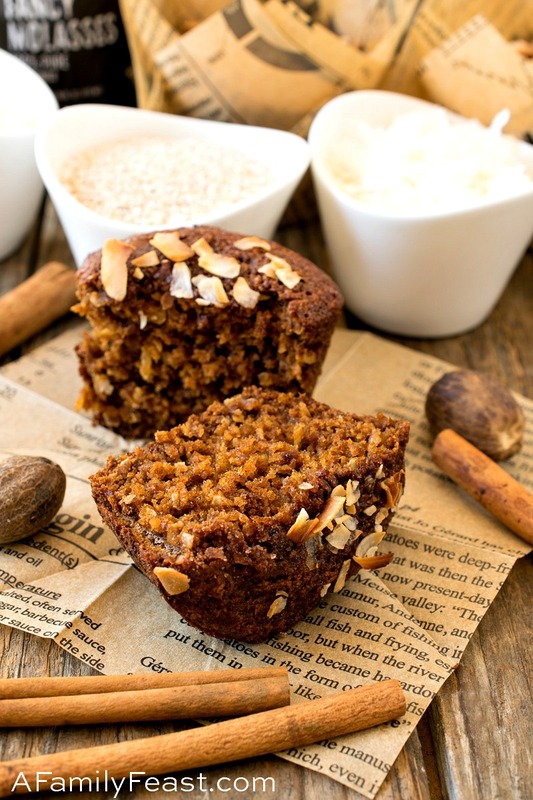 After studying the list of ingredients, he spent the last few weeks recipe testing until finally – on the third attempt – he came up with this moist, delicious, and perfectly sweet Coconut Oat Bran Muffins recipe. 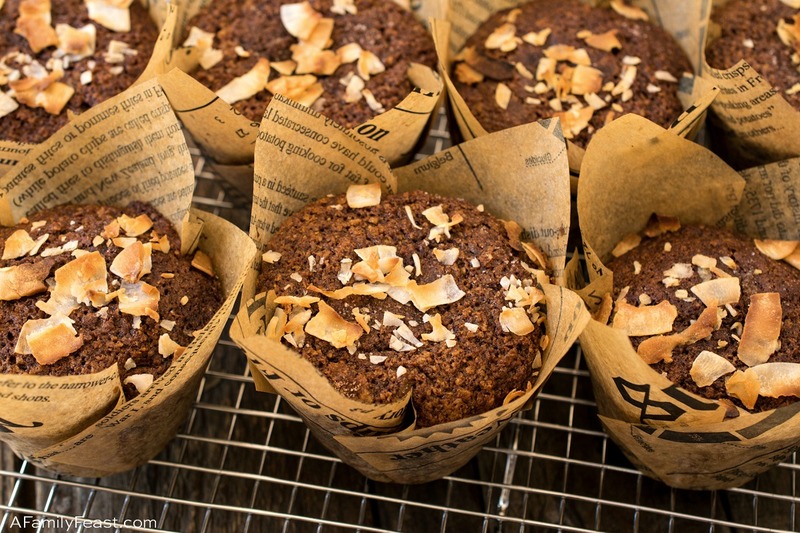 How do you make Coconut Oat Bran Muffins? 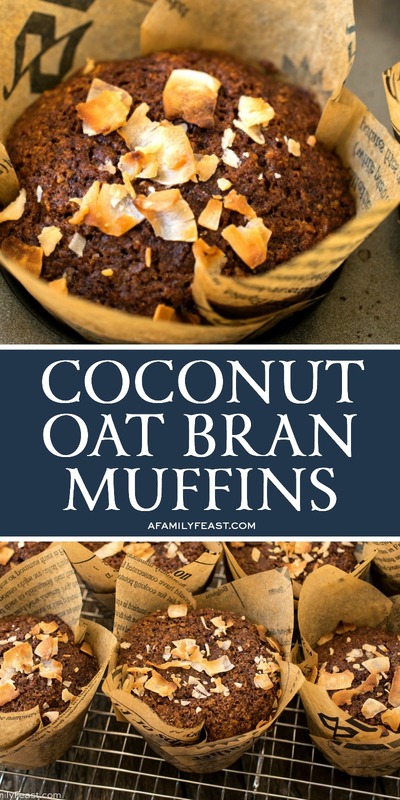 These Coconut Oat Bran Muffins are a blend of oat bran, oat flour, all-purpose flour and sweetened shredded coconut, plus cinnamon, nutmeg, and a little malted milk powder. 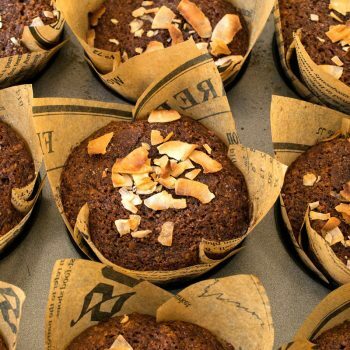 Molasses adds a distinctive richness, sugar and Lyle’s golden syrup add sweetness, and vegetable oil and applesauce add moisture to the finished muffin. We also topped the muffins with flaked coconut, sugar and cinnamon – but you could make these Coconut Oat Bran Muffins without that topping if you prefer. The third time was definitely the charm – and these Coconut Oat Bran Muffins have all of the same, delicious flavor (minus the crunch) of our favorite Cracklin’ Oat Bran cereal. P.S. 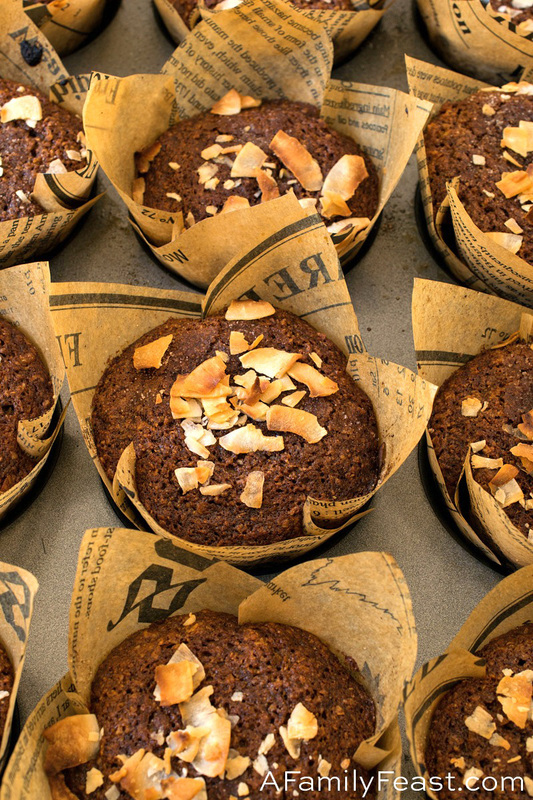 In case you are admiring those cute newspaper muffin wrappers, you can buy them here. Preheat oven to 400 degrees F with rack in center of oven. Place shredded coconut in a food processor and run for five seconds to break up the coconut from strands to small pieces. Pour into a large bowl. Add oat bran, flour, oat flour, baking powder, baking soda, cinnamon, salt, malt and nutmeg and stir to combine. In a separate bowl combine oil, molasses, golden syrup, sugar and applesauce. Whisk to combine. Add eggs and whisk again. Add wet to dry and whisk together. Divide batter between the 18 cups. Mix the sugar with cinnamon and sprinkle over the 18 tops. 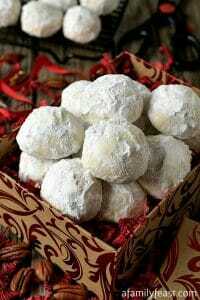 Sprinkle the coconut flakes over each. Bake one pan at a time for 15-20 minutes each. Ours took exactly 19 minutes for each pan. 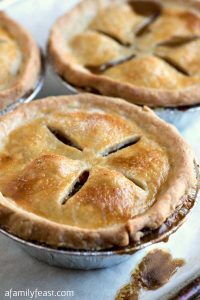 If you take them out too early before the center is fully cooked, they will sink as they cool. 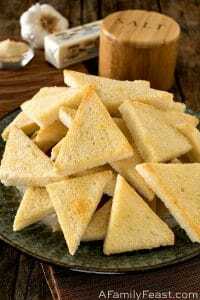 Do the tooth pick test to make sure they are fully cooked. If too much molasses is used in a recipe, sometimes it can give the muffins a bitter taste. We countered that by using a combination of molasses and golden syrup. If you can’t find golden syrup, all molasses will work, but again, you may experience a slightly bitter taste. 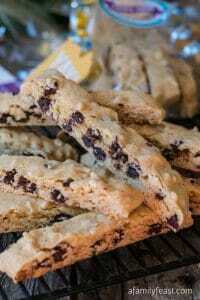 If you can’t find oat flour, use all all-purpose flour.